Gorgeous 4-bedroom modern villa with an excellent sea-view location on the wooded headland between Kata’s two stunning beaches. With a large curved edge infinity swimming pool, a spacious pool terrace with sala, a large lofty living/dining area, excellent staff and wonderful cuisine this stylish villa is hard to beat! 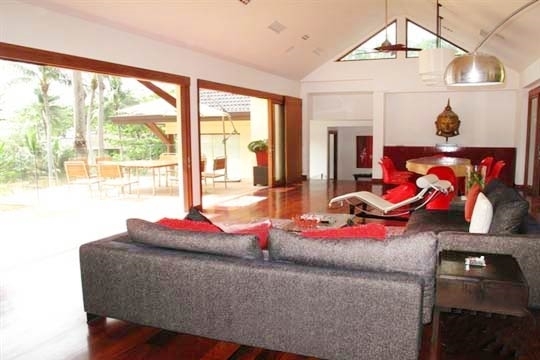 If you like your villa to be modern, serene and stylish then Baan Saleah is definitely for you. Its uncluttered interior design is incredibly luxurious and relaxing. Here a range of natural and modern materials, textures and colours seamlessly merge; smooth terrazzo, hand-chipped marble, sparkling glass, soft fluffy cushions, shaggy rugs and brightly coloured furnishings. 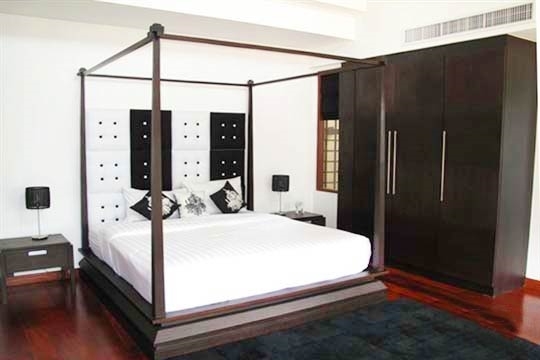 Many of the villa’s pieces have been custom made, such as the luxurious king-size beds; whilst the deep candy cushion-adorned swinging daybed in the sala, and the six-bladed ceiling fans in the bedrooms and living room are interesting and unique. 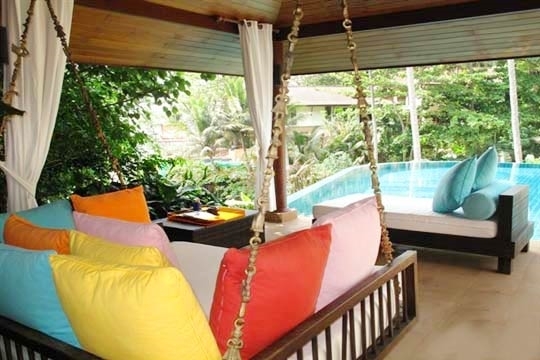 Other furnishings such as the romantic double canopied chair, the giant leather beanbags and a collection of brightly coloured lounge chairs enhance the villa’s sense of fun. Baan Saleah has been beautifully constructed around a huge granite boulder, fringed by tropical greenery and accented by a little waterfall that gently gushes in the background. From each level you can enjoy a fabulous ocean vista accompanied by a constant melody of birdcall. The four bedrooms are in pairs and offer ideal accommodation for two families whilst the dining terrace is a stunning place for entertaining friends, or just each other, as you soak in the tropical scene. The curved edge infinity swimming pool hugs the hillside and has a magnetic charm offering hours of fun. 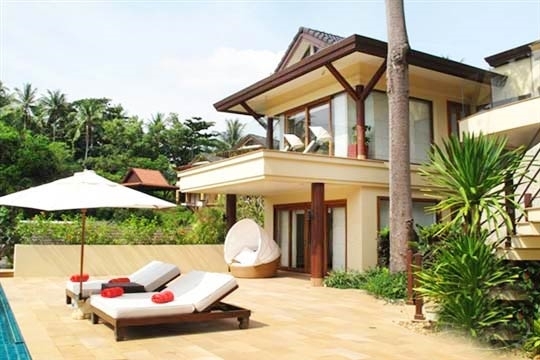 Double sun loungers scatter the sun-drenched terrace beside a fan-cooled sala. Select some music from the Sonos sound system’s well-stocked library and hear it played throughout the villa and on the pool terrace. Two lovely live-in maids and a chef who creates sumptuous Thai and international cuisine according to a menu (charged at cost price) are on hand to look after you so well that you may feel disinclined to leave the relaxing confines of the villa. However, Kata’s two beaches are stunning and the village itself has an excellent selection of restaurants, cafes and shops that simply must be explored; and all only a five minute walk down the road! From our arrival, the staff looked after us with thought and discretion. 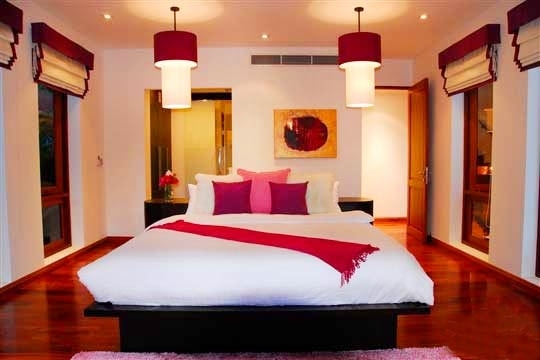 With an obvious flair for interior décor, the owners of Baan Saleah have created a gorgeous villa whose furnishings and fittings are modern and luxurious. Not only a treat on the eye however, they have been carefully chosen with tropical relaxation in mind, and it’s these soothing comforts that struck us. We enjoyed sipping cocktails while gazing out to the ocean at sunset from the step seating in the infinity pool, and the cushioned sun loungers and swing chair in the sala were gorgeous places to relax at any time of the day; we spent much of our time here. We thought the décor of each bedroom was truly unique, complemented by the soothing bathrooms with gorgeous marble washbasins and powerful rain showers as well as a delicious collection of toiletries. The ‘drinks’ kitchen with its fully-stocked fridge, and the guest bathroom and outside shower near the pool were very convenient. From the moment we arrived at the villa to the time we left, the uniformed staff of three really looked after us with thought and discretion. The villa was also immaculately clean and tidy. 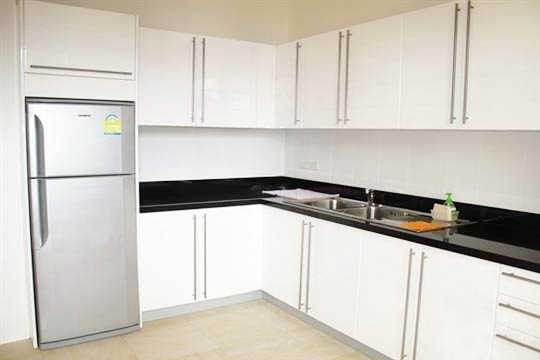 Laundry is included and collected from your room each day. Guests can choose their meals from a large menu of Thai and western cuisine, and only pay for the cost of the ingredients. The Thai food is excellent, making the villa even more appealing. We’d definitely recommend this villa for decadent honeymooners, couples, families and groups of friends; it’s perfect for a celebration. We don’t recommend Baan Saleah for those who would have difficulty with lots of steps. Excellent service, great food and a very relaxing ambiance aided by luxurious furnishings and a wonderful design. 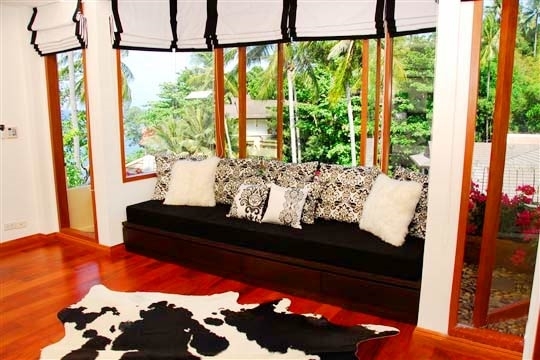 Although the villa is private, its proximity to the two lively Kata beaches is also a highlight. 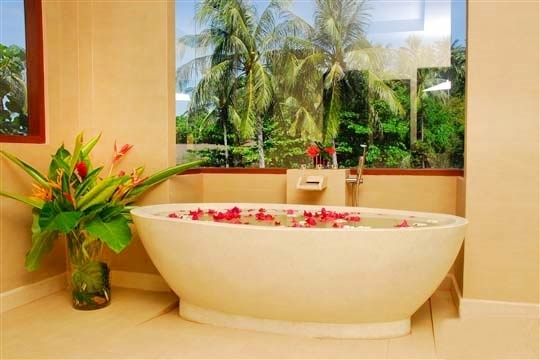 No unpleasant surprises, except perhaps that the water pressure can be quite fierce at times so remember to turn on the taps slowly to avoid an unwanted soaking!e this stylish villa is hard to beat! Simply exqcuisite. It is so much better than what it looks in the pictures. Outstanding service and staff. The best Thai meals I have had at very affordable rates. Ideal location. Very high standard of accommodation. Cannot fault anything. Absolutely love this villa, would love to go back. Great location, staff, and simply amazing food. To make even better would have been good to have mosquito coils, as lots of them! Also more blinds in the master bedroom as very light very early! 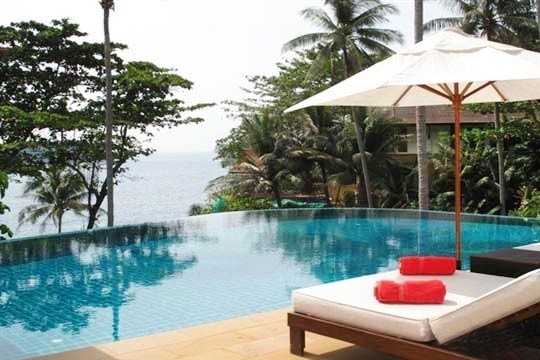 Baan Saleah is in an excellent location. 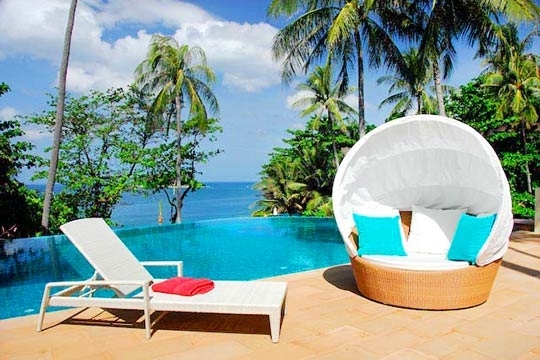 Built on the southern headland between Kata’s two popular beaches in a secure, quiet, private estate, the villa overlooks the deep blue ocean and verdant Pu Island in the distance. Just a five minute stroll down the hill takes you into Kata village and onto the longer stretch of Kata’s main beach. To the south side of the villa, you can walk down to Kata’s other beach, Kata Noi, which is smaller though just as scenic. The main entrance to Baan Saleah is flanked by little fountains. As you walk through the imposing doors, you enter a spacious gable-ceilinged living/dining area with sliding glass doors on each side. The comfortable living room is furnished with a bright white sofa set, while in the dining room the table is formed from one huge slice of polished tree trunk and is surrounded by eight white designer chairs, opposite which a beautiful Buddha statue reminds you where you are. 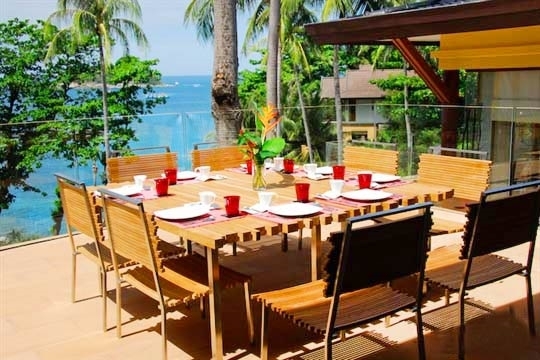 To the front is a wide terrace with wooden dining table for eight overlooking the sea. 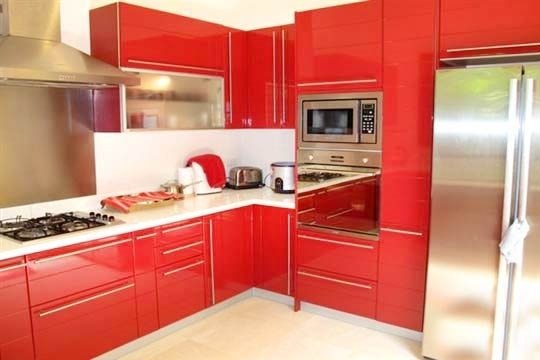 To the rear of the living room is a very modern, fully equipped western style kitchen (fitted with striking scarlet units) and the maid’s room. 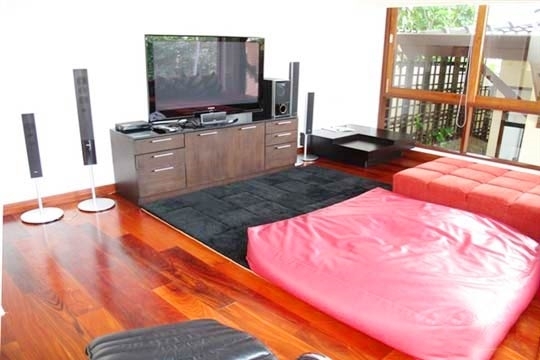 To the left is a glass-walled entertainment room where a squashy sofa, large leather beanbag and fluffy rug provide heavenly comfort (all rooms are air conditioned) for watching a DVD on the huge plasma screen TV. To the far side of the living room is the Red Room, with cushions, lampshades and a novelty lounge chair all in the room’s namesake colour. With a king-size bed and furnished balcony overlooking the sea, this room’s glass walls make it especially light and spacious. Situated below the Red Room, the Purple Room is similar in design but opens onto the pool terrace where a gorgeous canopied chair faces out to sea. Both the Red and Purple Rooms have delightful bathrooms with terrazzo moulded tubs, hand-chipped marble wash basins plus inside and outside rain showers. Beside the Purple Room is a drinks kitchen with fridge and a washroom. 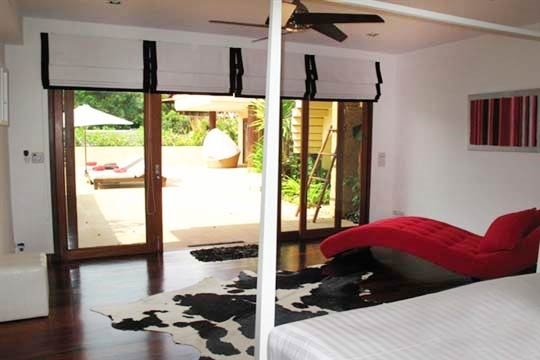 The third bedroom – the White Room – sits back from the poolside sala, and boasts a custom-designed king-size four-poster bed with unique black and white headboard, white built-in wardrobes, a cow-skin rug and a hot pink novelty chaise longue. From the pool terrace, a flight of stone steps lead up to the Black Room which has a four-poster bed finished in dark wood, a dressing table, a soft rug, a cushioned window seat and windows that lead onto a bougainvillea-accented balcony overlooking the pool. 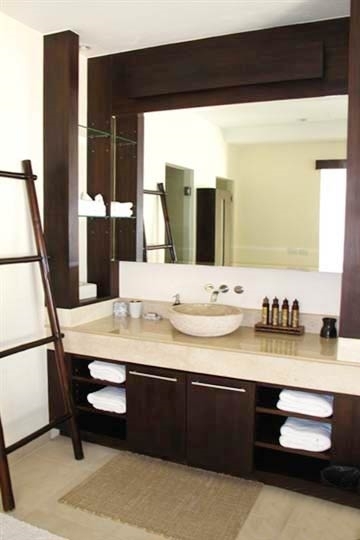 The bathrooms of the Black and White Rooms have tubs, rain showers and single hand-chipped marble washbasins. Upon arrival at the villa you are required to pay a security deposit. The security deposit will be returned to you prior to departure less any extra charges or costs for accidental damage to the property. The security deposit is 20% of your villa rental amount. You can pay by either cash or by credit card. One of Phuket's most popular beaches, Karon is alive with sun worshippers, speedboat and jet-ski rental operators. Even so, Karon's wide swathe of fine golden sands allows for a windswept, lonely feel even at the height of the tourist season. During the monsoon season months swimming can be dangerous so be sure to heed the red-flag warnings. Impromptu beach volleyball games are regularly played in the late afternoon on the quieter north end. With glittering soft sands and a shallow bay, Kata Beach is where families seeking fun in the sun set up camp on the sands. In the calmer months of November-April, many enjoy snorkelling or floating on the glassy surface, while the bay is taken over by surfers seeking wave action as the southwest monsoon rolls in. A playpark next to Club Med offers more adventures for the wee ones. Quieter and smaller than Kata Beach, Kata Noi, literally "Little Kata", is a pretty bay just around the cape to the north of Kata. Snorkelling, swimming or simply lounging on the sand are the main activities here. Renowned Chef Tummanoon shares his culinary expertise in half-day Thai cooking courses at Mom Tri's Villa Royale that include wine pairing tips and a trip to the local market. Classes are held on the 11th and 24th of every month. Delve into Thai culture while enlivening your taste buds by joining this Thai Cooking Class, led by the resort's well-regarded chef. The class includes a visit to the local market to select all the ingredients used in the course. Sitting between Chalong and Kata at an elevation of over 400 metres, this colossal 45 metre Buddha statue crafted from white Burmese marble enjoys the best 360-degree views of the entire island. 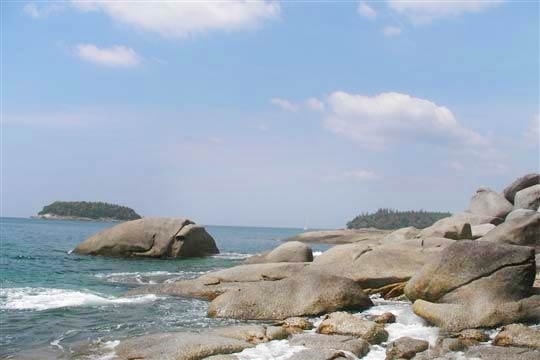 It’s located 6km off the island’s main drag. Ring the bells as you make your ascent. Among the more ecologically aware dive shops, Phuket Scuba Club offers dives off Karon Beach and day trips out to the Racha Islands and other spectacular dive sites in the region. Set high in the hills, this is one of Phuket's better-run elephant camps, offering rides lasting 30-60 minutes through lush jungle, with views out over Kata Noi Beach for those who take the longer tour. This 72-par, 18-hole golf course surrounding Crystal Lake was designed to take full advantage of the dramatic tin mine site upon which it was built. Golfers are faced with a number of natural hazards including prevailing winds, meandering lakes and deceptive slopes but these are more than made up for by the sweeping views over Chalong and Phang Nga bays. Get there early to avoid missing out on the best fruits and veggies at Kata's Somjit daily fresh market, open daily until about 7pm on Patak Road near the PTT petrol station. Those in the know looking for even better-value fresh produce visit the twice-weekly market that sets up on New Kata Road every Monday and Thursday. Even if you're not in the mood to buy, it's a great way to catch a glimpse into Phuket's lively and colourful market life. This 18-hole mini golf course featuring authentic scale replicas of prehistoric creatures is always a big hit with the kids. Its restaurant is good, too, with cocktails for mum and dad to enjoy. Perched right on top of the rocky headland that divides Kata’s two beaches, this fine dining seaview restaurant boasts international cuisine, a lengthy wine list and excellent service. Best known for its hot crab soufflé, Phuket lobster and Angus beef tenderloin. This longstanding restaurant remains one of Phuket's most romantic with a serene alfresco setting on a rocky perch at the edge of the small headland that juts between Kata and Karon beaches. Great seafood dishes and wines. Try to book early to catch the sunset. As its name suggests, this is the place to enjoy a cold sundowner beer and tasty seafood after a day at the beach. Reached via a spectacular drive up along the lush, winding road between Kata and Cape Promthep, this chilled-out dining spot and bar is simply a semi-covered platform stretching out from the hill (though this platform seems to grow wider each year as word has gotten out). 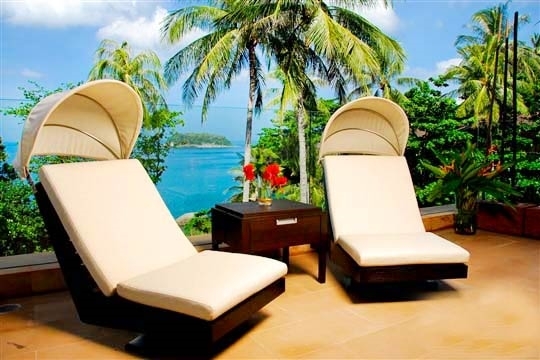 Expect a fair amount of Bob Marley music to accompany those amazing sea views. This cosy, friendly eatery serves up pastas, salads and pizzas with the freshest of ingredients, all at a very good price. Good selection of wines available to accompany the meal. It's a bit of a steep drive to get here, but Kampong's classic Asian ambiance makes the effort worthwhile. Dine on beautifully presented Thai dishes, seafood and western fare while taking in the antiques and hand-crafted decor. This award-winning Thai and French gourmet restaurant is well known for its grill and extensive wine cellar that features over 800 labels. Have a nightcap in the Galley Bar afterwards. 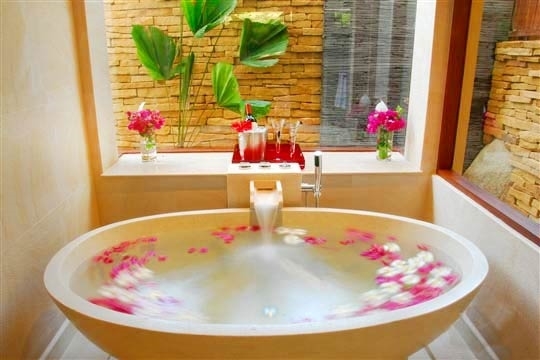 With an Arabian-themed setting fit for a king, no sense is left uninspired here at Sawasdee resort's lavish spa. Offers a full range of treatments including its signature stress-relief Kesa head massage. A smaller branch of the wholesaler supermarket brand sells fresh meats, deli items, cheese, milk, canned foods, cereals, fruit and vegetables, beer and spirits. Offering three classes daily in a bright studio, with the occasional morning class on the beach, this is the place to build strength and stamina in an invigorating 90-minute session. Surf year round at Phuket's only flowboarding venue with a fun party vibe every evening and a casual rooftop bar and restaurant to enjoy the sunsets. Great fun for kids and adults alike. Enjoy fabulous sunsets in bright, chic surrounds at this resort restaurant on Kata's headland. Serves Mediterranean and Thai cuisine highlighting fresh seafood, and puts on special movie nights and brunches on selected Sundays. 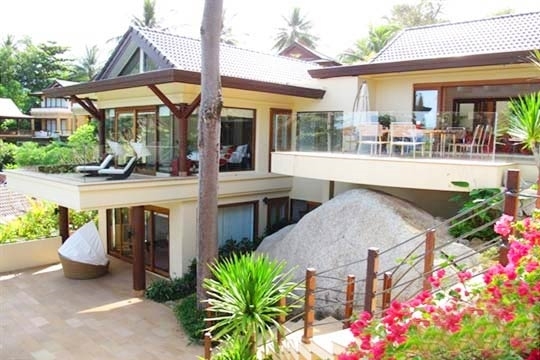 4 bedroom villa located in Kata, Phuket. Ideal for Beach in ten, Body and soul, Bring the relatives, Kid friendly, Fair share for groups, Party pads, Room with a view, Walk into town. 9 out of 10 based on 3 user reviews.